Stars: Adam Driver, Jonathan Pryce, Will Keen, Paloma Bloyd, Oscar Jaenada, Stellan Skarsgard, Olga Kurylenko, Jordi Molla, Joana Ribeiro. The struggles faced by idiosyncratic and maverick filmmaker Terry Gilliam in trying to bring to the screen his long gestating passion project about Don Quixote have been well detailed in the fascinating 2002 documentary Lost In La Mancha. That film told of the storms that destroyed sets, the lack of financial support and the ill health of its star, all of which combined to halt production within a week of the project starting physical production. Now some twenty years later we finally get to see Gilliam’s vision reach the screen. And it is a flawed, imperfect and unwieldy beast liberally filled with the filmmaker’s signature stylistic touches and unique, quirky sensibility. Co-written with Tony Grisoni (who collaborated on the equally bizarre and incomprehensible Tideland), this something of a shambolic mess with its chaotic structure and non-linear narrative. 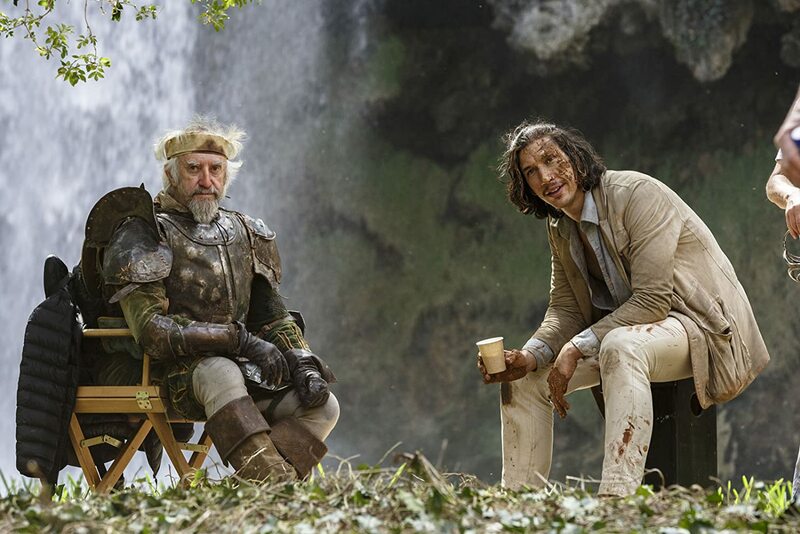 The Man Who Killed Don Quixote is very meta in style, with lots of references to the original concept that Gilliam began shooting in 2001. But it is also a trenchant critique of the film making process itself as well as the producers and backers who like to play it safe. The film is heavily driven by some inane slapstick sequences and lots of busy subplots, many of which end up going nowhere. Gilliam has recast the roles that were originally intended for Johnny Depp and the late Jean Rochefort. Adam Driver steps into the role of Toby, the egocentric and hapless central character, a filmmaker who comes to Spain to shoot a Russian vodka commercial for his financiers. While in Spain he comes across an old student film he shot ten years earlier telling the story of the chivalrous knight errant Don Quixote. Toby cast Javier (Jonathan Pryce) in the role of the knight who tilted at windmills. Now Toby reconnects with Javier, who has become delusional and really believes that he is Quixote. Javier mistakenly identifies Toby as his faithful but dim-witted servant Sancho Panza, and the pair reluctantly set out on a road trip across the countryside with plenty of comic misadventures. But the film goes off the rails by the third act as Gilliam tends to throw just about everything at the screen in the hope that some of it sticks with his frenzied, nonsensical approach. The film has been nicely shot in widescreen by his regular cinematographer Nicola Pecorini (The Imaginarium Of Doctor Parnassus, etc), who captures the magnificent wide-open spaces of the setting. Costume designer Lena Mossum uses the original Quixote suit of armour created for Gilliam’s 2001 film by designer Gabriella Pescucci. Pryce and Driver create a wonderful odd couple dynamic that drives the film. Driver brings a lugubrious quality to his performance and throws himself into the more physical elements of the performance, while Pryce is hilarious as the heroic dreamer and delusional warrior. The musical Man Of La Mancha remains firmly entrenched in the minds of most cinemagoers and this fanciful take on Cervantes’ legend of Don Quixote is unlikely to dislodge those memories. Ironically this is another example of Gilliam tilting at cinematic windmills.